Hey guys, Cody Sperber here. If you guys have been following me for a while, you know that I am a huge believer in cracking the code to conquer fear. Unless you can overcome your fears, you will never be a successful investor. Make it a daily habit to shift any negative attitude. Decide to change your mood and outlook to positive. Feed your mind only positive thoughts. Fill yourself with positive affirmations and they will become your reality. But, if you want something more in your life and you want to make the kind of money that supports the lifestyle of your dreams, then you need to start to train your mind to embrace failure. What I fail and I lose money? What if I fail and people laugh at me? Whatever your reason for fear is, it’s usually created by you and has no foundation in reality. 1. It weeds out the competition. I am so thankful that what I’m doing is just hard enough to weed out my weaker competition. It makes winning at the game of real estate so much more enjoyable than if every ding dong on the planet could do it. 2. Give yourself permission to fail. Think about that. If you give yourself permission to fail, you will always work through challenges with optimism. At the end of each day the challenges make you a better investor. Now, I think we’ve all been there before in some area in our life, and real estate is no different. No matter what gets thrown at you, don’t freak out. But, if you do, here’s a couple points to keep yourself in positive check. Any issue that you run into is something that many others have faced before you. I guarantee someone else has run into the same problem or mistake and found a way to overcome it. With the right mindset and education, there’s nothing that you can’t absolutely get through. Absolutely nothing! It’s the journey to reach the final goal that’s important. Now, it’s not about winning or losing that you should be focusing on. I mean, let’s face it. If making money by investing in real estate is easy, everybody would be rich. The fact of the matter is that winning is just an extension of one’s core values, attitudes, preparation, perseverance and sacrifice. Successful people all have one thing in common: their ability to overcome their fears and venture into the unknown with a “can do” attitude. At first, every task that you do will feel uncomfortable. Stay positive and remember that it’s your job to go over, around or right through any challenges that you face. Fear isn’t real. It’s just a villain that you create in your mind. Picture yourself crushing that villain that holds you back from your goals and that lifestyle that you once imagined could finally be your reality. Think with the millionaire mindset. Your core strengths will grow with each and every obstacle that you overcome. 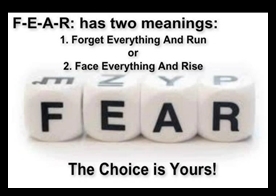 It’s your job to slay your fears and challenges to obtain financial freedom. And with that, it’s a wrap. I hope you guys fully digested these nuggets I gave you. Now go out and conquer the world without fear and fill your pockets! 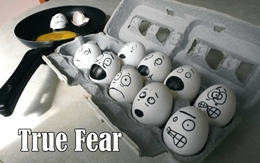 What did you do to overcome your fear? Share in the comments section below.